I was first introduced to The Draft exhibition by African-Canadian artist Esmaa Mohamoud just around a year ago. I was far from the familiar, quaint Ann Arbor, in the bustling international hub entirely different country to be precise! While that statement exaggerates what was essentially a weekend jaunt to Toronto, there is no exaggeration when describing how impressive this series of work was when I first saw it. Thankfully our campus was bestowed the privilege earlier this fall to host Mohamoud’s amazing series of work, and I was eager to compare my experience viewing it in a local setting to how it was displayed at the prestigious AGO in Toronto. When I first arrived, although the gallery door was firmly locked, I was officially within the 10am-5pm time period that the gallery should be open to the public. 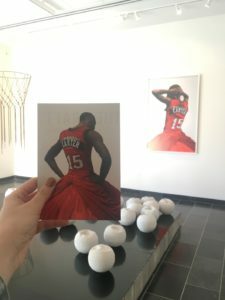 Thankfully after quickly asking the front office about gallery they were more than willing to unlock it for me, so don’t be discouraged if you find yourself in a similar position. The pieces were spread out between two rooms, with the first room being a dedicated space to show the exhibit, complete with both various sculptures and photographs. The second being a conference room with three of the large scale photographs hanging on the wall. The space in the first room was very well utilized, with a low sculpture placed in the middle activating and working in harmony with the pieces around the room. On the other hand, while the large-scale photography works certainly elevated the conference room they were hanging in, I couldn’t help but feel slightly disappointed at how these meaningful photographs felt relegated to the same level as the generic abstract paintings used to spice up mid-tier hotels. 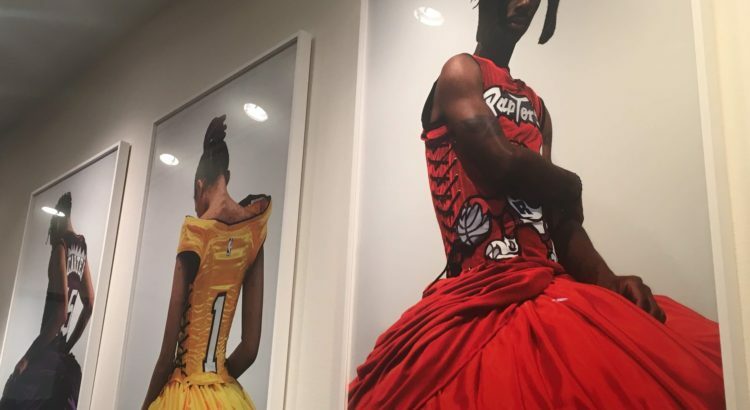 While I wouldn’t have guessed many of Mohamoud’s intentions with each piece without reading the description, her passion for basketball shines through in the way she handles this series. 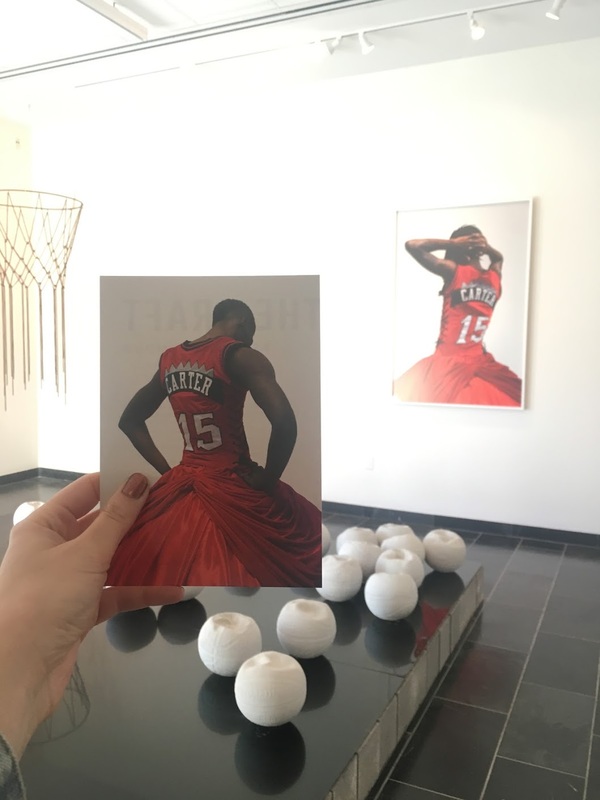 As for what I did glean from the description posted outside, the series meant to explore themes of “gender, race, empowerment and disillusionment” within the world of basketball. 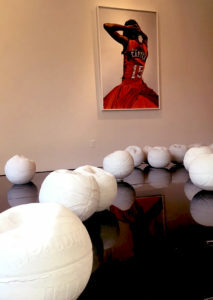 The white, deflated basketballs in the main sculpture are meant to represent the 30 NBA draft picks every year and the rusted chain hoop is meant to “suggest the weird allure and enmeshment of the past.” The photos of men in basketball jerseys and large ballroom-esque hoop skirts is a representation of Mohamoud’s complex feelings growing up as a girl immersed and in love with what was considered a “men’s sport,” and I also argue could be a statement on perceived masculinity in today’s sports world as well. 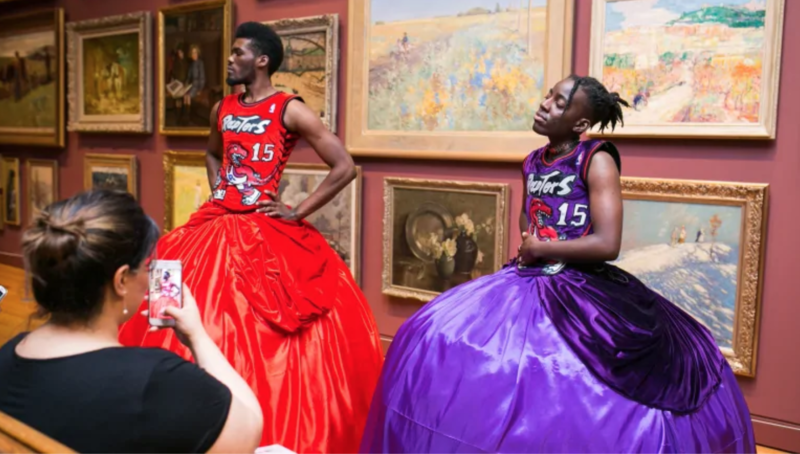 When the work was displayed in the AGO in Toronto, Mohamoud had the original models from the photographs in the series wear the same outfits and perform in the space. 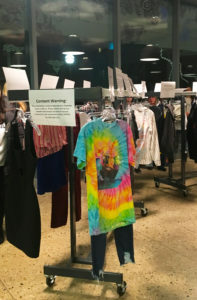 While I was not able to attend the performance itself, I did get a chance to see the dress in person, which we were not able to display here at UM. I found this to be truly unfortunate as the dress was, by far my favorite part of her work. It’s sheer size and volume are unable to be captured by the cropped photographs shown in the exhibit. Below is an image of the models wearing the dresses so viewers can get an idea of what they were like. While I would have loved to see one of the dresses on display in conjunction with the other pieces, I know that there were probably a long list of complications that kept from UM being able to do so, and the gallery space itself would have nearly been dominated by the dress’s physical size and presence even if it was somehow able to be displayed. The Gallery is often rotating new and exciting exhibits, available right on campus free to students and the general public alike. 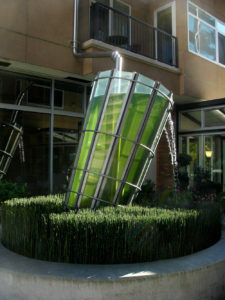 The exhibit is the first door to your left upon entering the South Thayer building, and the building itself is directly across the street from the MLB and North Quad. 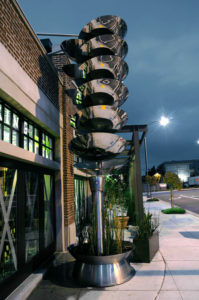 Be sure to check out the upcoming exhibition as well, as the gallery is constantly rotating shows. 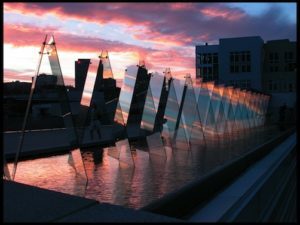 I highly recommend taking the five to ten minutes that it takes to hop into the gallery any any day you need a quick artistic pick-me-up or shot of inspiration while walking around campus. 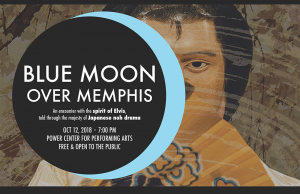 Friday the 12th of October, the Univeristy of Michigan will be treated to to a unique take on Japanese Noh Theater, with a performance of Blue Moon over Memphis by the English speaking noh-drama troupe THEATER NOHGAKU. It will be at the Power Center located right off central campus and completely free to the public. 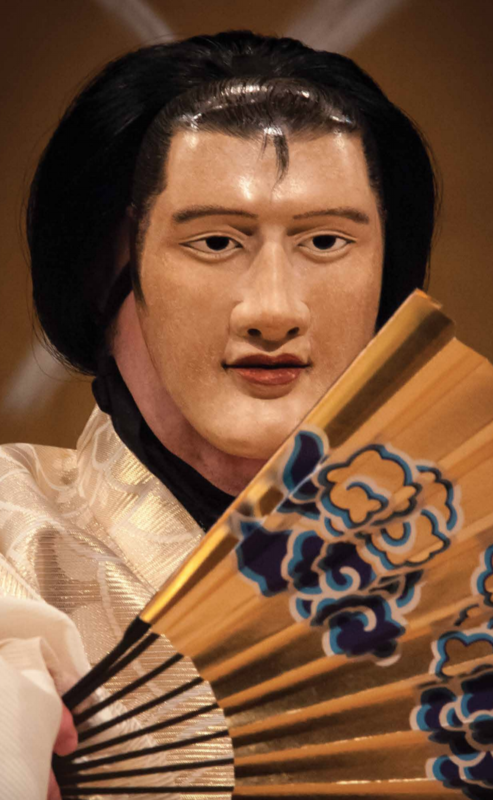 This unique east-meets-west theater experience explores one of the most revered and influential figures in American pop-culture history, through the unexpected lens of a several century-old form of Japanese theater. This event is a part of the Toyota Visiting Professor 30th Anniversary Special Lecture Series and made possible by the Japanese Studies Department. The play itself will explore one woman’s haunting loneliness as she makes a pilgrimage to Graceland on the anniversary of Elvis’s death, where she has an otherworldly encounter with the spirit world . If you plan on attending, please head over to Eventbrite and RSVP for Blue Moon Over Memphis here. The event is entirely free, but space is limited so don’t forget to RSVP and check for an email confirmation. Additionally, if your interest has been thoroughly piqued as mine has, definitely check out the play’s brief promotional video bellow to get an idea what’s in store! 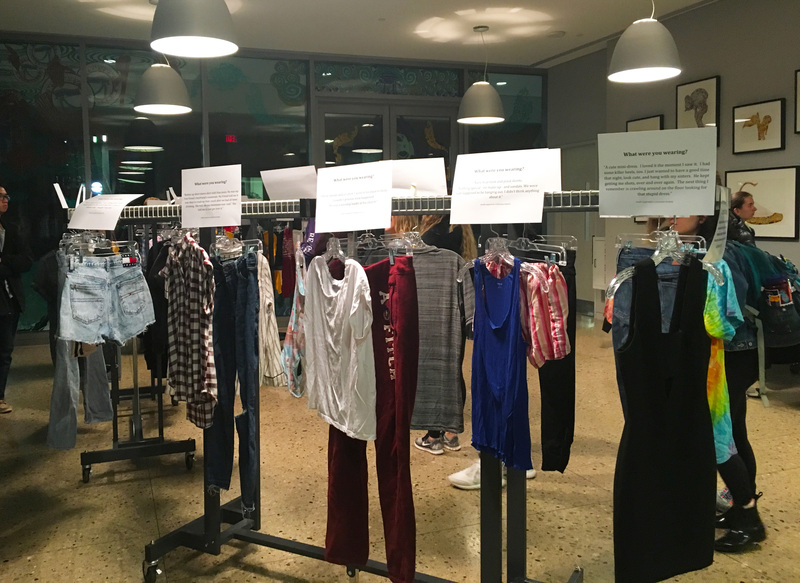 This past December, the Umma hosted an incredibly thought provoking and sober exhibit named “What Were you Wearing.” It aimed to raise awareness about sexual assault on college campuses and the ways in which sexual assault is addressed. While “What Were You Wearing” was only shown for a single day, I have no doubt that it impacted many students all across campus with its powerful message. 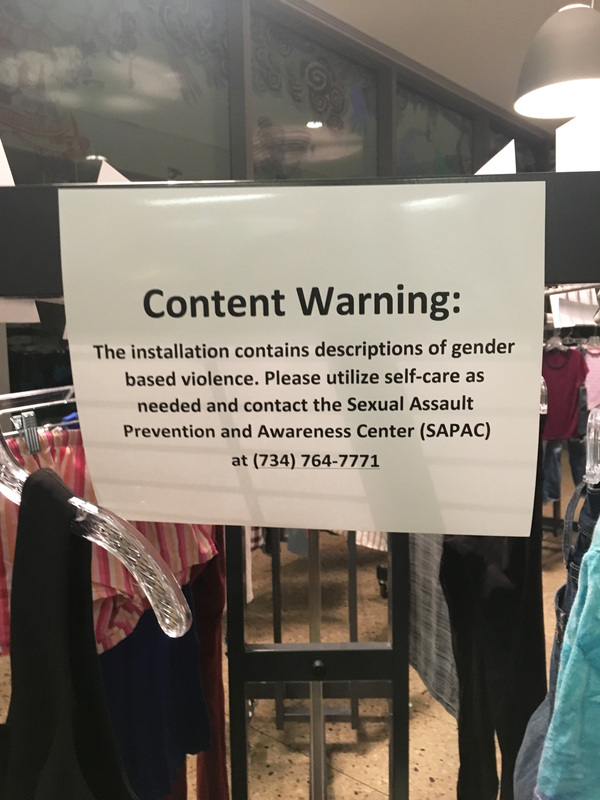 Just as the exhibit itself featured clearly displayed content warning signs, this post also comes with a content warning, as the topic of sexual assault and and images of clothing worn during instances of sexual assault will follow. The venue for this show was nothing less than perfect. With the well lit and simplistic layout of the exhibit being surrounded on three sides by large glass walls, it was clearly visible to passersby’s, inviting them into a light space within the darkness of campus. 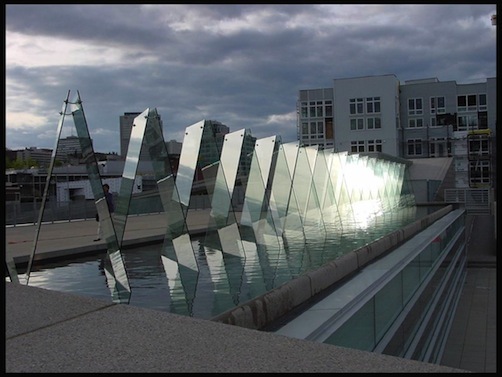 Even without actively stepping inside the Umma, students were able to participate in the exhibit to a certain degree by viewing it through the glass. Additionally those who spreading word of the exhibit through word of mouth, making others aware of the exhibition even after the single day that it was displayed. 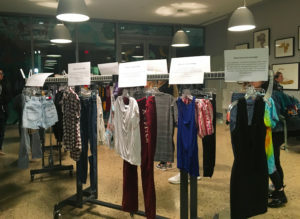 What stood out to me the most was the clothes themselves, featuring trendy brands and styles and casual wear that I see daily walking around campus. This drove home the fact that sexual assault can happen to anyone, wearing any possible item of clothing. 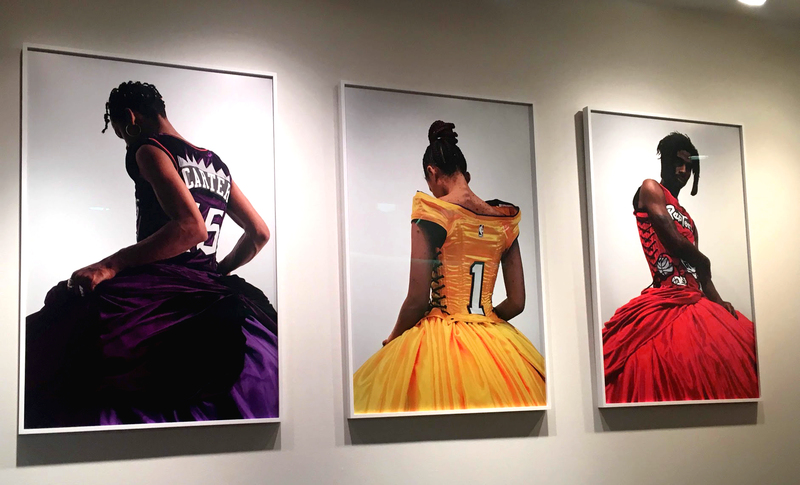 Below are some images from the exhibit and the clothing on display. During the brief amount of time I myself was present at the exhibit, there was a constant stream of people trickling into the commons, hushed voices and quiet footsteps showing a shared sense of solemnity regarding the serious nature of the exhibit. The visitors formed a sort of slowly moving conveyor belt and were able to quickly walk through the exhibit, shuffling along and taking everything in in about 10-15 minutes at max. Despite not being very large, the exhibit was extremely powerful, and the fact that it takes such a short amount of time to take in ensures that many people can see and experience the pieces. When I asked about being able to possibly document the event for this very post, I was told by one of the coordinators that while I absolutely was allowed to further share the story they were trying to tell, he wanted me to make sure to put a trigger warning before I posted any of the details or stories from the exhibit themselves. I appreciate the level of concern and respect shown by the coordinators and think that it came across well in the exhibit itself, with warnings posted on either side as shown at the top of this post. This Friday night, the 8th, stop by Necto to see the most recent champion of the emmy-winning TV show RuPaul’s Drag race, Sasha Velour! Sasha is a Brooklyn based queen who uses her training in visual art to create dynamic and emotive performances that are a treat for the eye and the mind. Since her win she’s traveled the world, stopping in Australia, South America and Europe, before finally gracing our small town of Ann Arbor! The dragster events are held once a month, and feature performances from both internationally famous drag queens and tremendously talented local performers from both the Detroit area and all across the state. This week’s event will be hosted by Jadein Black and Chanel Hunter, and the show will also feature a cast of local talents. The event will be 10$ at the door for those under 21, and only 5$ for those over! Necto is an 18+ venue so be sure to bring your ID. She’s expected to draw quite the crowd so arrive early, although the first show officially begins at 9:45 with an encore at midnight! PREVIEW: What Were You Wearing? 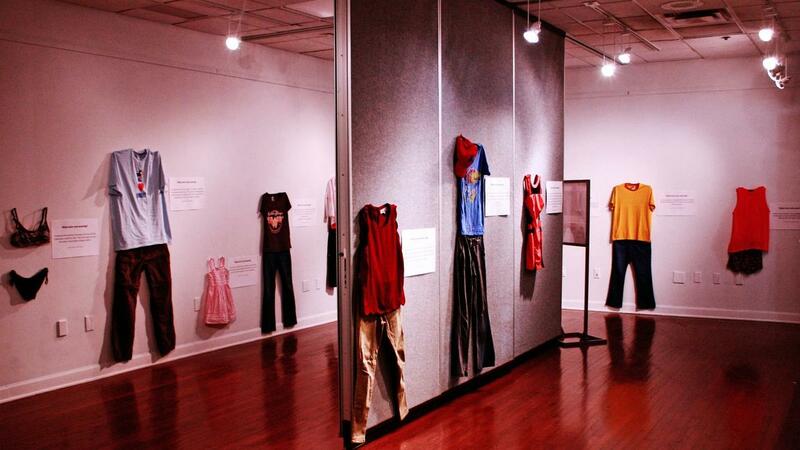 Displayed previously at the University of Kansas, this thought-provoking exhibit is stopping here at the University for just one day, so be sure to check it out. 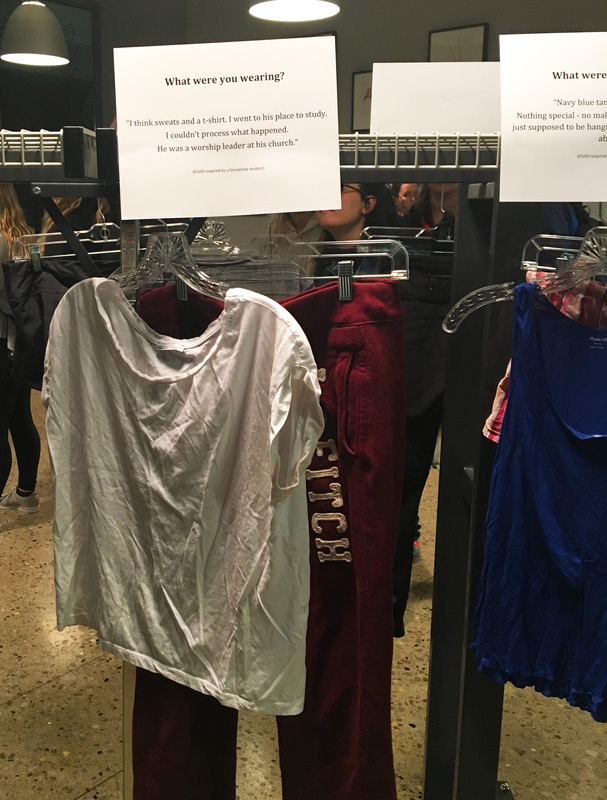 Featuring 18 stories of sexual assault , the exhibit hopes to challenge victim blaming and the idea that sexual assault survivors are ever to be held responsible for the crimes of others. 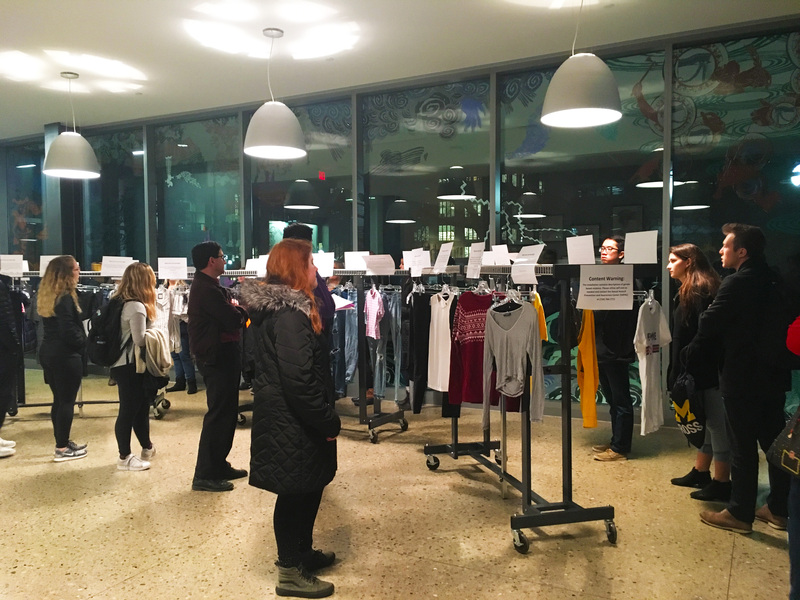 This event was organized by HeforShe and should be an important step in promoting both reflection and conversation here on campus. This exhibit will be housed in the commons of the UMMA this coming Monday, Dec 4th, from 5:30-8:30. The exhibit is FREE to all and there will be desserts and refreshments provided by zingermans so be sure to stop by and check it out!